Get Access to our Free Online Seminars and Subscribe to the Conure Training Mini Course and learn more about Conure Training, Diet, Care & Health - FREE!! The Conures are lightly built, with long tails (Conure literally means 'cone tail'). They come in a diverse range of colors. Conure beaks always have a small cere and are usually horn-colored or black. These birds are affectionate clowns who are a whole lot of fun to own. Their coloring is truly exquisite; you will find shades of gray, white, red and orange mixed with their basic green, depending on what part of the Latin American countries they are raised. They run in length approximately twelve and a half inches. If your Conure has become too noisy or disobedient or aggressive, our Conure Training Course will teach you how to train it and stop it from screaming and biting. 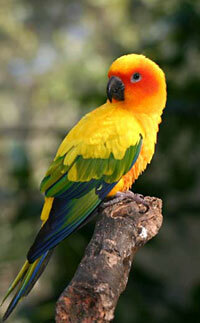 In the wild the Sun Conures are friendly and peaceful birds. Give plenty of fresh water to your Sun Conures for happy and healthy birds. A Green Cheek Conure is intelligent and playful. 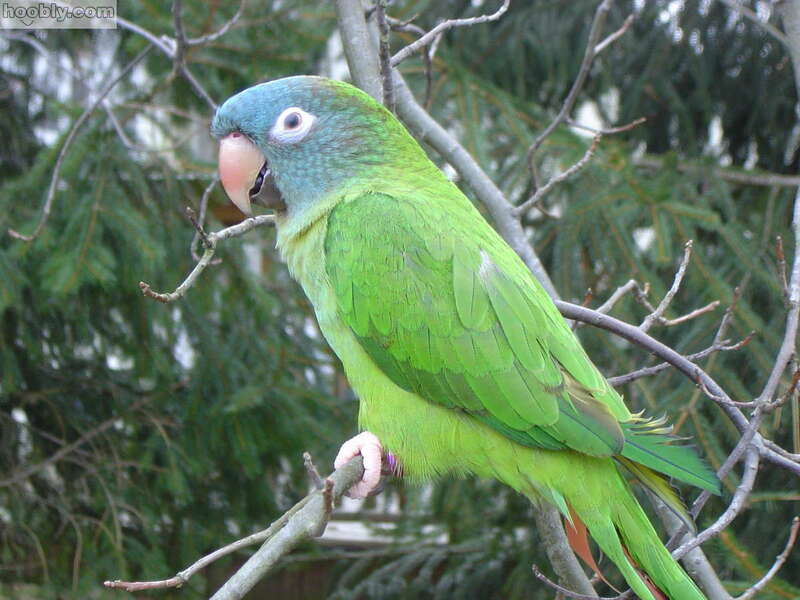 A Green Cheek Conure is very sweet natured and can be easily trained to talk. The Blue Crown Conure has been regarded as one of the most intelligent Conures. A Blue Crown Conure can be taught to perform several tricks, such as sticking out their tongue, waving their foot and kissing. A Nanday Conure is one of the most colorful birds in the parrot family. A Nanday Cconure can be taught tricks and to speak. The Jenday Conure is a very playful and entertaining bird, and can be trained easily. A Jenday Conure is a very good family bird because it tolerates the loudness of a family and the quick actions of children. Their native habitats are mostly in South and Central America. 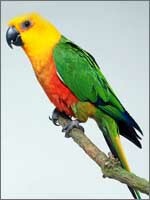 Conures have been imported into the United States since the late 1800's; however, by the early 1980's, importation had almost entirely been replaced by captive breeding programs. This in turn led to birds being sold that were inarguably healthier and better suited emotionally to captivity by virtue of handling and hand-feeding beginning at an early age. Conures are noisy birds. Almost all have loud voices, and like to use them. They aren't notable talkers, but almost all will speak a word or two. Some species are better than others, but it mostly depends on the individual. They are active, playful, bold, and affectionate. They have remarkable mood swings, but in a good way. One minute they'll be acting the clown, climbing on their toys and screeching in mock anger, the next minute they'll be curled next to you, begging for a scratch. Conures beg for attention all the time. They're great at learning tricks; many will lie on their back and "play dead", and hanging upside-down from a finger is an easy one. Some Conures are one-person birds, others more out-going. The Conures thrive on friendship and companionship. They tame very quickly and in no time you can expect your particular species of Conure to be clamoring to be let out of his/her cage, sit on your hand and shoulder, pull toys and imitate sounds. Some Conures can be nippy, especially with people they don't know, but a little careful training can rid most of the problem. Conures are charming, enchanting and beautiful birds. These birds are famous for their amusing nature and liveliness. Special attention should be given to a pet Conure's hygiene and care, especially to its nails and beaks. They also require good amount of exercise and activities so that they don't get bored. Conures love taking baths - it also keeps their feathers sleek and shiny. Training Conures is a challenging job. Expert training is the fundamental phase of owning Conures. It requires great dexterity and patience. Repeated praising and treats would make them adapt to the training easily. Conures are active and playful birds, who need a large cage to clamber around in. A large cockatiel cage will do for the small Conures, the others will need a good-sized parrot cage. Be careful where you place those perches; if those long Conure tails rub against the bars the tail feathers will become very ragged. Give your Conure lots of toys, it will use them with gusto. They like toys they can destroy, but make sure there's no small parts they can swallow or openings where they could catch a claw or beak. Your Conure will also appreciate a large play stand, again, equipped with lots of toys. Bar spacing: 5/8" to 3/4"
Conures are no fussy eaters. A Conure should be provided with proper diet to keep it happy and content. A pet Conure's regular diet includes pellets, veggies, nuts, fruits, small sized pastas, cooked chicken or turkey and other bits and pieces of foods. Give plenty of fresh water to your Conure for a happy and healthy bird. Beware, that a Conure can become bored with formulated diet that can trigger off negative behavior. How To Keep Your Conure Healthy? Free Online Seminars on Training Your Conure: Join our training experts on one of our FREE online seminars and learn how to train and take care of your Conure correctly. When you subscribe to our FREE online seminars and email course on Conure, you will discover the natural instincts of your Conure and learn about Conure training, diet and care - FREE! !